Disclosure – we were given tickets to ZSL London Zoo for the purpose of this review and paid for our time. All opinions are honest and our own. A little known fact about me – I was born and grew up in London. It explains why I love the city so much and I have so many great childhood memories of all the things that I did and saw during my time in the city growing up. One of my memories is of visiting London Zoo, or ZSL London Zoo as it is known now so I was really excited to take my children there to experience it for themselves. ZSL London Zoo is located right in the middle of London, about a ten minute walk from Camden Tube station. We actually drove into London and booked private parking a few minutes walk away. Parking cost us £10.50 for 24 hours which we thought was great for London and it worked out cheaper for us to drive in and park than it would be for five of us on public transport. As we walked to the entrance we could see some of the animals from the road and the children were so excited, they literally couldn’t wait to get in! Luckily we had pre-booked tickets so entry to the Zoo was quick and painless. We picked up a map and a guide to the talks that were running that day and set off! First of all we popped into the shop to pick up some fun items for our day out – my children love dressing up and there was a great range of dressing up items in the shop. The picked some ears and tails each and the younger two loved swishing them around as they explored the zoo and they got lots of lovely comments from passers by! 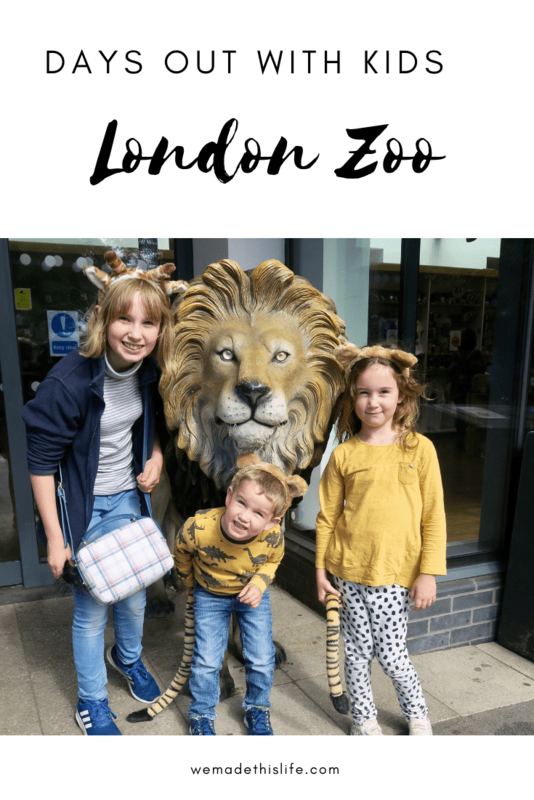 We have been to quite a few zoos on our travels as the children really enjoy them but there was so much at ZSL London Zoo that we hadn’t seen before. They had a fantastic ant display and I was in awe of the giant soldier ants! They also had the most amazing walk through spider experience which I’ll never forget! All three children were brave enough to walk through – and there were some massive spiders in there! It was quite something to be able to see such huge and different spiders up close without any glass barrier. Other highlights for us were the penguins which were happily swimming in the sunshine! I’ve actually never seen Penguins move so fast – they were darting and diving all the over the place! We also loved the giraffes as they are one animal you don’t see much in zoos. We took a little rest in the giraffe enclosure and watched them eating their hay for a while, they really are majestic creatures. The children loved seeing the lions and tigers too – Little Boy was very pleased that the Lion saw him wearing his lion ears! There is also a great petting area where little ones can pet some farm animals. Unfortunately I couldn’t go in there because I’m pregnant but the children got to pet a donkey which made their day! I’m sure this area is really popular with younger children. What I loved about ZSL London Zoo was that there was so much information available about all of the animals. There were boards up everywhere and information printed on the walls, in a bright and interesting way. It meant that visiting the Zoo was a great learning experience and we came away much more knowledgeable than when we went in! We visited ZSL London Zoo on a Sunday and while there were plenty of people there it didn’t feel too busy and the children could easily get to see everything which was nice. We were able to wander the Zoo at a gentle pace which was lovely and there was so much to see, you could very easily spend an entire day there. We didn’t manage to see everything so we will be looking forward to going back one day to catch up on what we missed. We had a brilliant family day out and would highly recommend ZSL London Zoo as the perfect family day out. There is a restaurant and little cafes and ice cream huts as you walk around as well as plenty of picnic benches so you can easily spend a day here and take your own lunch or buy something when you are there. It felt very spacious and relaxed and we just had the most lovely day.